Last week, an online media outlet (that does not need to be named here) posted a link to an article and entitled it ‘Our favourite animal that thinks its human moment…’. This struck a cord with me – and not because I believe that animals, on occasion, may/could think of themselves as human. Now this may not strictly have an historical element to the story, and because of that I have been quite undecided as to whether to share this as my first post. But, upon reflection, if I can’t write about it here, where can I write about it. Animal art was the subject of an exhibition earlier this year at UCL’s Grant Museum, and they have a written an excellent blog on the subject, which saves me covering a lot of the same ground. The training of animals, elephants in particular, to produce art work clearly raises the question of the ‘real’ motives behind their actions. The paintings they produce cannot therefore be described as an expression of their inner ‘thoughts’ and ‘feelings’ – concepts that most of us think of art being expressions of. However, if we put aside the notion of elephant art, and even that of the chimpanzee that is also discussed by the Grant Museum (which I think could be argued as being a more genuine expression than the former), there are other versions of art that perhaps have a more substance within this sort of debate. Take this Bower bird nest. Can it be seen as a piece of sculpture in its own right? It is thought to serve a purpose in attracting a mate, but it is perhaps a more elaborate means than some other birds adopt. Robins are satisfied with their red breasts, blackbirds have their song, so why do bower birds feel the need to build such elaborate structures? And can they not be regarded as sculptures, and as such an art form? I do not admit to being able to provide an answer to these questions – at least not yet anyway. What intrigues me more though, and has had me scratching my head, and arguing in circles, can these ‘sculptures’ be seen as expressions of emotion? Now this is a nineteenth-century concept that will be returned to on many occasions in this blog. My ‘instinct’ is to answer no – that their choice of shape, and the colours of the flowers and seeds that are used to adorn these spaces are purely based on instinct – on attracting the best mate possible. But, as a quick search on Google Images reveals, these nests come in a huge variety of shapes, sizes and colours. Can this all just be an graphic illustration of the ‘survival of the fittest’ concept? Or is there something else that accompanies this drive to impress? Dennis Dutton, in his book, The Art Instinct, deconstructs the relationship between ‘possible’ animal and ‘actual’ human art. For Dutton there is something deeper and more cultural about art, a factor that defines it as a purely human endeavour. The evolutionary instinct for this form of expression is located post the genetic separation from the Chimpanzee, located somewhere in the 4% of genetic difference that lies between us as species. Although, he does concede that the Bower bird perhaps comes closest to what he defines as the artistic instinct of man. To quote Dutton: ‘From beaver dams to African termite mounds to New Guinea Bowers, animals construct stunning objects and put on spectacular performances’ (The Art Instinct, p.9). Yet none of these are art. Is it perhaps because they all serve a purpose – be it accommodation or attracting a mate. And art, for all intents and purposes, in human culture has no such purpose. And if we extend notion of artistic expression into other forms of visual display by animals, as was argued by my husband during one late night discussion on this subject, does it still stand up? Can you count the display by the peacock or the bird of paradise, as similar artistic expressions? Most people, including myself, would argue that these are no more artistic expressions than me getting dressed up for a night out. So have I just argued myself out of my own point? Perhaps I have. However, there still remains the fact that the whereas the peacock and birds of paradise do not have a choice on the colour or elaborateness of their physical displays, the bower bird still appears to make a choice about the ‘sculptures’ they create and decorate. Something still drives them to choose the pink flowers over the blue flowers or the mass of shiny black seeds over brown ones. So to return to the headline that first started me thinking about the human-ness of art. The circularity of this blog is, I think, a clear indication that I am no closer to resolving my thoughts on whether there is such as a thing as animal art. The problem starts in the definition we each adopt in understanding what art is, and what it is an expression on. The training of animals to produce ‘artworks’ to sell to the public, is clearly a definition of art on shaky ground, and one which neatly fits into sentiment of art as a purely human endeavour. 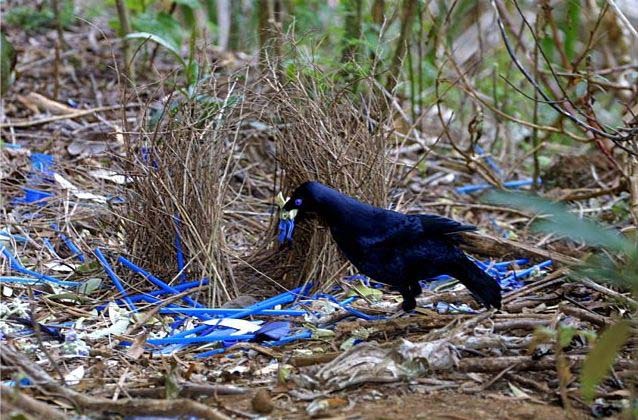 However, I still believe there is something to be said about the bower bird and the individuality that can be seen within the structures they build. Whether it can be said to be an expression of artistic sentiment – well, I will leave that for you all to ponder on. This entry was posted in Emotional Animals, Emotional Currents, Philosophies of Emotion, The Museum of Emotions and tagged animals, art by Liz Gray. Bookmark the permalink.